January 14th, 2014 – The variations in the economic activity have been decisive to the evolution of the electricity demand in 2013 in Mediterranean countries such as Spain or Italy. The electricity consumption in these countries decreased compared with 2012, consistently with the economic situation. In higher latitudes such as in France or in Great Britain, the evolution of the electricity demand has been affected by more extreme temperatures in addition to the economic activity evolution. Electricity demand decreased in Great Britain due to exceptionally warm temperatures during most part of 2013. On the contrary, in France, temperatures registered in winter of 2013 were lower than those of winter of 2012. This fact entailed an increase of the annual electricity consumption. 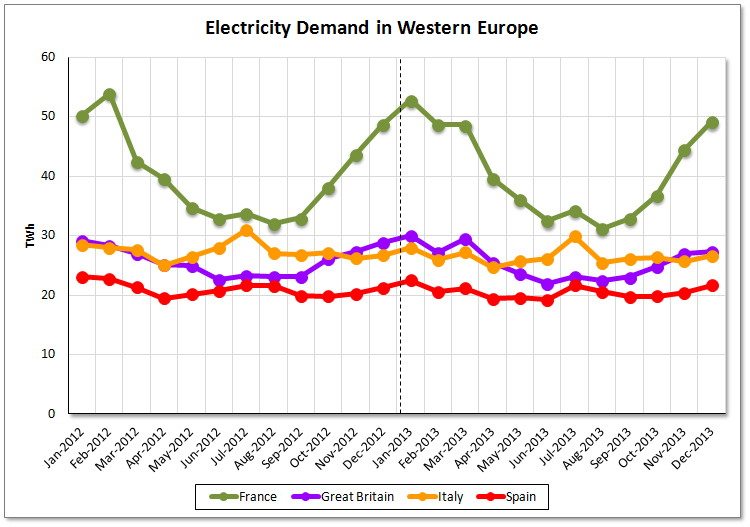 Evolution of the monthly electricity demand in Western Europe – 2012 and 2013 – (GWh). Sources: France: RTE, Great Britain: National Grid, Italy: TERNA, Spain: RE. In 2013, the electricity consumption in Spain diminished a 2.2% compared to 2012. However, in the last quarter a year-on-year growth rate of 1.4% was registered, reversing the year’s trend. The year-on-year variation of the GDP was negative for all quarters, but the decrease has become less and less significant until a rate of -0.4% in the last quarter (still with provisional data). In Italy, the electricity demand lowered in all quarters of 2013 compared with the same periods of 2012, resulting in an annual decrease of 3.2%. According to preliminary data, the Italian economy registered a contraction of 1.9% in 2013. The electricity consumption in France increased in 2013 a 0.8% in comparison with the previous year, in agreement with a growth of the economic activity of 0.2% following provisional data. A winter colder than the one in 2012 also contributed to such a growth. In the case of Great Britain, the electricity demand diminished a 1.3% despite a positive variation of the GDP in the United Kingdom (1.4% following still provisional data). Such decrease was mainly due to the occurrence of warmer temperatures in summer and autumn of 2013 compared with the previous year. A growth of the economic activity is expected in 2014 in both northern and southern countries of Western Europe. 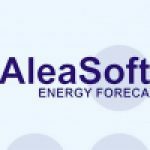 Because of this, the electricity demand forecasts issued by Aleasoft indicate a growth of the demand compared to 2013 in all countries except France, where a small decrease is expected due to the exceptional temperatures in winter of 2013. The year-on-year variation of the electricity demand in Spain during 2014 is expected to be 1.6%, assuming an annual GDP growth of 0.5%. In Italy, the annual electricity consumption is expected to increase by 1.0%, considering that the GDP will grow by 0.6% compared to 2013. The electricity demand forecasts in France indicate a small decrease of 0.2% compared to 2013. These forecasts have been made using a GDP growth scenario of 1.0% for 2013 and a mean temperature scenario. The electricity demand in the Great Britain in 2014 is expected to be 1.8% larger than the one in 2013, assuming an annual GDP growth in the United Kingdom of 2.4%. 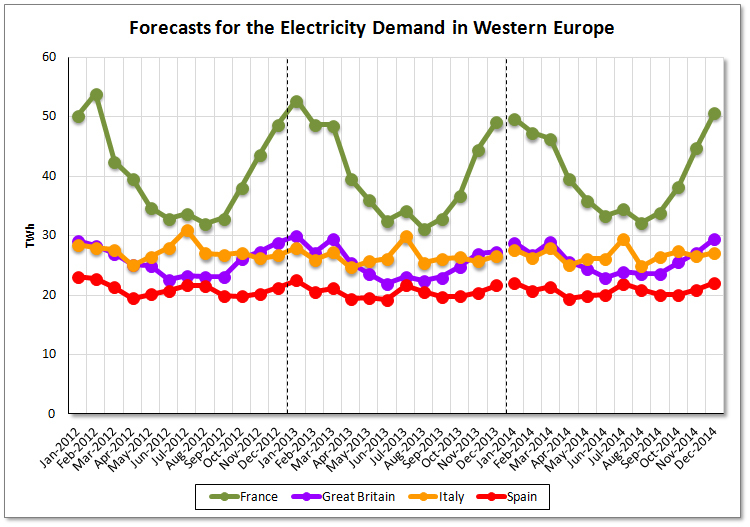 Evolution – 2012 and 2013 – and forecasts -2014- of the monthly electricity demand in Western Europe (GWh). Sources: France: RTE, Great Britain: National Grid, Italy: TERNA, Spain: REE, Forecasts: Aleasoft.